Moves to return speed cameras to Oxfordshire's roads are under way just months after they were switched off amid cash shortages. The cameras were turned off on 1 August after £600,000 was withdrawn due to budget cuts. The county council said it had been in talks with police and was "close to an agreement" to have them reactivated. 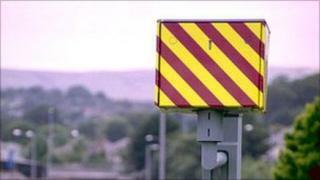 A safety group has previously said the number of drivers speeding past the cameras had risen by up to 88%. The Thames Valley's Safer Road Partnership carried out tests on two roads for five days and 62 people were caught flouting the law, it said. An Oxfordshire County Council spokesman said: "We've been in discussion with our partners at Thames Valley Police and we're close to an agreement to have the cameras switched back on in the future. "We look forward to being able to reveal the detail of that agreement in future weeks." A Thames Valley Police spokeswoman also said it was "close to agreeing a new arrangement" with the council that "sees safety cameras switched back on across Oxfordshire". "Speed continues to be one of the main risk factors on the roads, and the safety cameras form an important of tackling driver behaviour. "We have been in regular communication with Oxfordshire County Council since the cameras were withdrawn and welcome their decision to support a new model," she added.